Well, I'm headed down to Cape Coral, Florida. Now Steve and Barb Hirsch have a very nice house down there. They want to put some ceiling panels in their family room. I'm going to see if I can help out. Their roomy, Spanish-style home is typical of those built here in recent years but their idea for dressing it up, isn't. They've invited me to Cape Coral to help them give their dim ceiling a dramatic new look. We'd been to a restaurant in Ft. Myers that had a ceiling done in pecky cypress. And as a matter of fact, I'm sure they thought we were rather strange because instead of sitting there eating, he was standing up taking pictures of the ceiling with his camera. [LAUGHS] Anybody come over and say, what the heck are you doing? Well, I was waiting for them to do that. So this was the restaurant here. Now wood ceiling panels are usually made from pine but the Hirschs fell in love with this once-abundant-but-now-rare native Florida wood called pecky cypress and special-ordered it from their home improvement center. 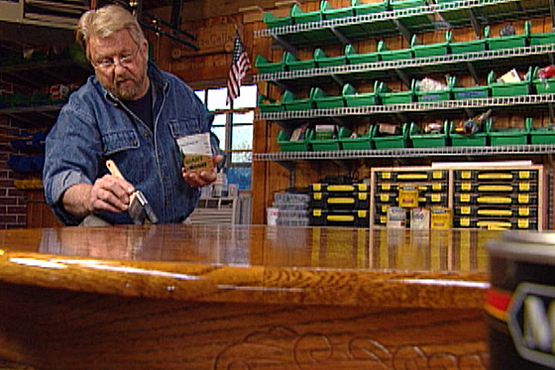 Pecky refers to the pockmarks or elongated holes that give this wood its unique character. After removing all the furniture, Steve and Barb use electronic stud finders to locate all the ceiling joists. They identify the location of each joist by snapping chalk lines. Our paneling planks will run perpendicular to the joists and will be nailed into them. But first the planks need to be cut to fit inside the beams. So Steve takes a measurement. I’m saying this looks like 61-and-1/4 here. Now it's likely there could be as much as a 1/4-inch difference between the beams from one end of each section to the other. So measurements are made about every 12 inches. Oh, yes, have all the measurements. All the measurements, all the studs are marked, we're ready to cut. That's right. We're ready to cut. And so what, what do we want to cut first, what length? Well, I guess we came up the — the first section is off just a hair so probably about half of them go in at 61-and-an-1/8th and the rest of them at 61-and-1/4 inches. Okay. So here's the way this thing works over here. — is we just loosen this up and we're going to do the 61-and-1/8th first, so we've set the edge of this right there at 61-and-1/8th. That way we don't have to measure each board. I've precut the end here, so we got a nice square end to start with. So who wants to cut first? I think it should be Barb. Oh you’re giving it to me. Okay. Okay. Bring it out like this. Bring it all the way down till it stops and then push it all the way in till it stops. Let it come up and then release the trigger. Our measurement is one inch off. Where it's, where it's 60-and-1/8th versus 61-and-1/8th. This is, this is why my things never fit, I just realized now. Only — it's only an inch. Thank you very much for catching that. Now this is very embarrassing. I hope that we cut this out of the show. Well, for the [LAUGHS] expert set straight by his student, Barb cuts the first of several planks at 61. I know, I know, 61-and-1/8th. Steve cuts the next batch of board slightly longer, since the distance between the beams is wider at one end. Now we've got one little problem here —there's a corner that's sort of cut off right here because of this fan light-box, so we're going to have to cut an angle on the end of this first board. First of all, I want to measure from this corner down to see where that angle starts. That's about 55-and-1/2. We'll mark that on the board. And then I want to see what the actual angle is. This is called a bevel gauge. I'm going to put it right in here, one side on that wall, one side over here and that's the angle that we need to accomplish. So this is the angle that we took off the ceiling. Okay, Barb, hand that board up there. Let's see what kind of an angle cutter you are. Drop it in here. Ho ho, I'd say that's just about perfection. Okay, guys. I think we can start to glue these up. Well, we've cut enough paneling for this first section up here. Now this is called tongue-and-groove paneling. Why, because each piece has a tongue and a groove. A tongue on one side, a groove on the other side. When we put this up, we're going to slip that tongue into the groove and this gives us quite a bit of strength. We're going to attach this up mostly with construction or panel adhesive. I'm going to put some on right now. I'm going to kind of apply this in sort of a serpentine pattern like this. Not too much, I don't want to make this too thick. Okay, guys, first board coming up, all right? So this is the one with the angle cut on the end. Put it right up there in the corner like we did before. Push it in and then push it up to the ceiling. Now pull it down from the ceiling. Pull it down again and then put it back up. That will make sure that the adhesive gets distributed. All right. Now you've got the pneumatic nail gun, you've got your ceiling joists marked, put a couple nails right into the joist there. [NAILING SOUNDS] We're off and running, guys. Here comes your next board. Okay, waiting on the glue man, huh? When we reach the wall, we're left with a gap narrower than our planks. So we measure it, transfer that distance to a plank and rip it to size on the table saw. Now Steve, here's the strip that you cut off. Before we put it up, we're going to have to make a little modification to it. And I've made up a little demo here to show you why. We want this to drop in next to that last full board, but you see, one side of the groove there is going to be getting in the way. So what we're going to have to do is cut that one-half of the groove off so that this just drops in like that. Then we'll glue and nail it in place. I've lowered the blade on the table saw and Steve pushes the plank through, taking off only the bottom lip of the groove. Now it's simple to slip the narrow board into the gap. Then we glue and nail it into place. Once it's up, we move on to the next ceiling section. Well, the boards go up nice and easy until we reach this speaker hole which we must cut around. Barb and Steve hold the first panel that overlaps the hole in place. Steve traces the arc onto the back and then cuts it out with a jigsaw. 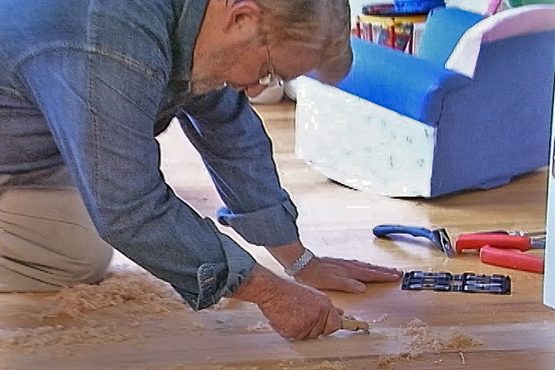 Steve applies the adhesive and Barb nails the board into place. Since the second panel would completely cover the hole, we first cut it into two pieces, leaving the end of the first piece slightly overlapping the hole. This time we trace the arc of the circle on the end of the plank. Then Barb takes a turn on the jigsaw to cut it to shape. We repeat the process on the other side of the hole. Finally, Barb and Steve trace and cut the third board, exactly as they did the first. We'll try and fit the speaker support rig —oh, look at that, just like downtown, couldn't be better. With the speaker hole out of the way, we take a little break from the ceiling panels and move outside to paint some wood molding which we'll use to frame each ceiling section. It seems to be just about perfect. Except when I'm working with you, Steve. 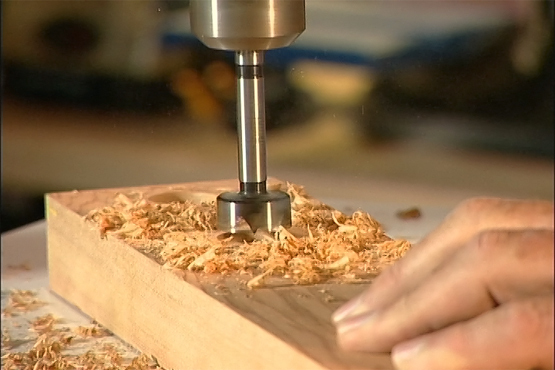 We work our way around each section, measuring, cutting and attaching the rest of the molding. Now for a final touch, Steve and Barb have elected to faux-finish the beams. After a long day, we can finally relax. And the ceiling looks absolutely beautiful. I love the pecky part. I do too. I can't believe the difference. I think the beauty to me is, I love the wood but with the focus on the ceiling, it kind of brings the room down a little bit, it makes it a little more cozy. And for name, the speaker — when we got to the speaker, wondering how we were going to get that hole cut. Some really good tips. Well, it did take quite a bit of challenging thought on my part. Well, the real credit for today's project goes to Barb and Steve who realize that ceilings deserve as much attention as walls and floors when it comes to transforming a room. Ron traveled down Florida's southern gulf coast to Cape Coral, one of the state's youngest cities. With more than 400 miles of canals, most of the homes here sit right on the water. Steve and Barb Hirsch invited Ron to their Spanish-style home to help them give their den ceiling a dramatic new look. They had fallen in love with a ceiling done in pecky cypress that they had seen in a restaurant in Ft. Meyers. Begin by using a stud finder to locate the ceiling joists. Once you've determined their location, mark them with a chalk line. Next, you'll need to take measurements to determine how long the planks should be. Be sure to take a measurement every 12 inches or so, as the size of the panels can vary greatly from one end to the other. A miter saw work station will allow you to set your length and make a number of cuts without having to measure and mark each plank. Once you've got the measurement set, cut each board and set it aside for installation. If you have an angle in your recessed panel, then one or more planks will need to have an angle cut in it in order to fit into place. Begin this process by measuring the panel to see where the angle starts. Next, use a bevel gauge to determine what the angle actually is. You can then use the bevel gauge to rotate the table of your miter saw to match the angle that is on the ceiling panel. Make sure that you use the left edge of the blade to align the correct angle with the gauge. 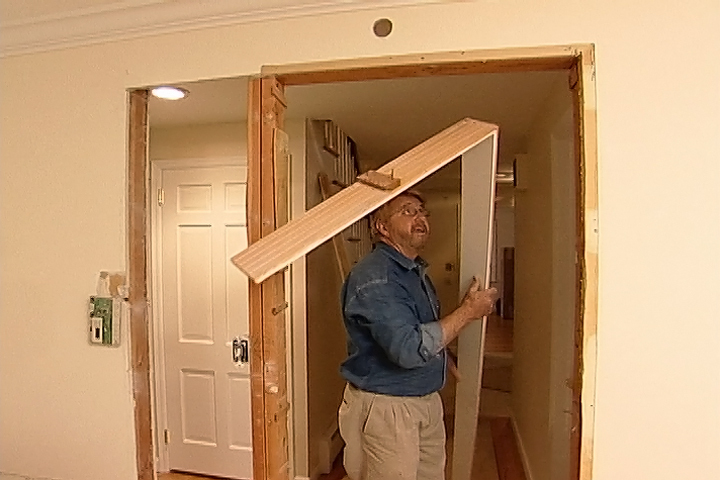 The planks will be secured to the ceiling using construction panel adhesive, with just a few nails from a nail gun. 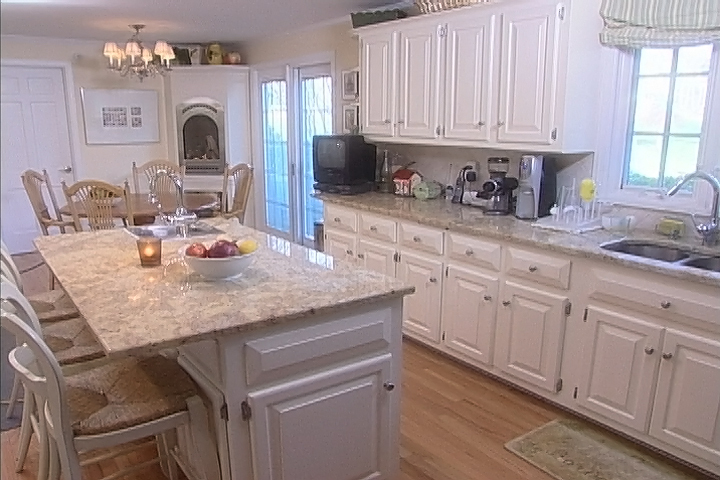 Apply the adhesive using a caulking gun in a serpentine pattern on the back of the plank. Set it into place and then pull it slightly away from the ceiling. Then push it back into place. This ensures that the adhesive is evenly distributed. After the plank is pushed back into place, secure it with a few nails into the joist that you marked earlier with the chalk line. 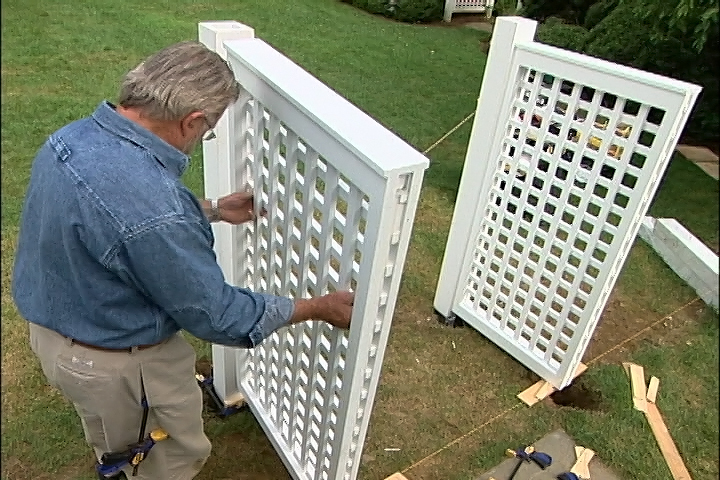 As you install the rest of the field, keep in mind that the groove on each panel has to fully engage the tongue on the previous one for them to fit properly. Continue setting each plank in place, and then pulling it slightly away before pushing it into its final position and nailing it. It is unlikely that the final piece in the field will fit exactly. 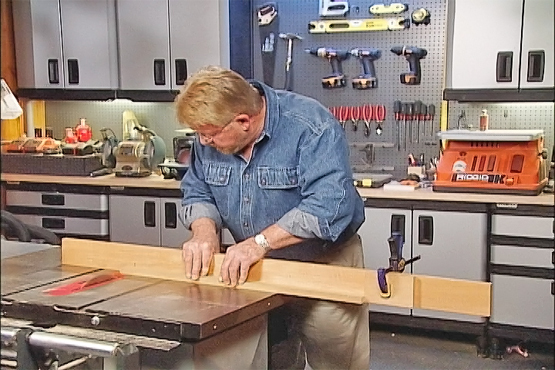 Measure the gap to determine the correct size for the final piece and then rip it to the proper width on a table saw. In order for you to be able to correctly install the piece, you will next need to lower the blade on the table saw and rip away the top lip of the groove. This will allow you to set the final piece in place and nail it into position. You will most likely have to cut around some sort of obstruction as you install your panels. Whether it is lights, speakers, or anything else, the process is pretty much the same. Set the first plank into place and the reach your hand up into the hole with a pencil. Trace the outline of the opening and cut away the excess with a jig saw. Repeat this process for each plank. If any plank is completely divided by the opening, cut it in half and repeat this step for both ends. 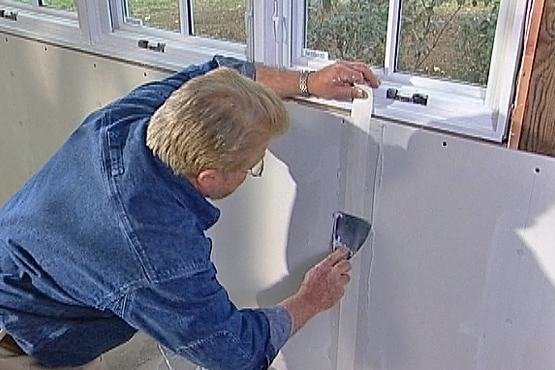 The final step is to install the trim of your choice around the outside of each panel. 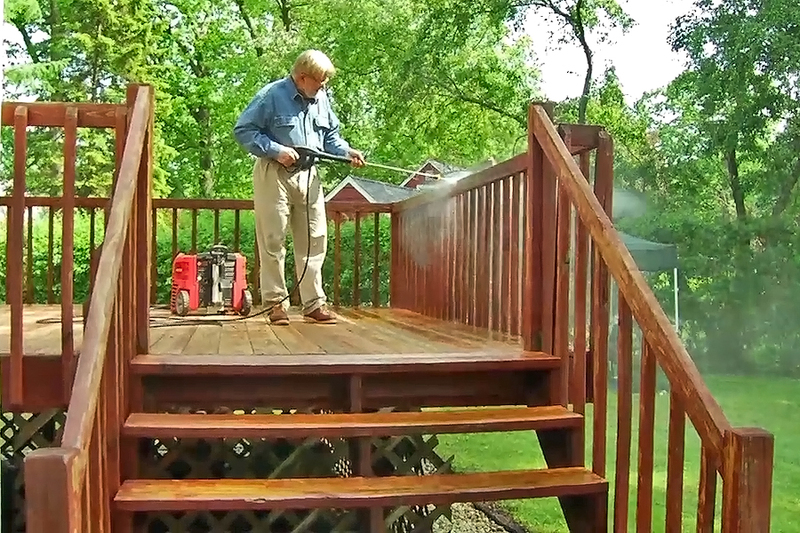 This will help cover any small gaps that you may have left at the ends of each plank. Remember, when cutting trim, it is always better to cut it a little bit long, as it's easy to back and cut more off if you need to. Continue working around each panel measuring, cutting, and installing the trim.